Thermos Funtainer Sippy Cup-What can I say? I don’t go anywhere without this. My daughter drinks a lot of water and this is relatively spill proof. My favorite thing about this is that it actually keeps her water or smoothies cold for hours. She can open and close the lid on her own. It has a little pop-up handle that she can carry it by. The only real con is that it spills if it tips over and the lid is not closed. Without the lid, it is NOT spill proof. Although Foogo makes a spouted version that is always spill proof, I prefer the straw because I can throw it in my purse and not have to worry about the mouth piece touching everything. Yumbox Lunch Box-This puppy has totally changed mealtime for us. My daughter is more of a grazer and she loves variety. The 6 compartment tray offers enough spaces for a good healthy variety. She especially loves to pick what goes in it. Her little hands can easily open and close this leak proof lunch box. Click here for a complete review. SoYoung Toddler Backpack and Matching Lunch Bag-These are just too darn cute! I love the style and durability. These are PVC, Phthalate, and BPA Free. The inside of both can easily be wiped down. Having her own backpack for "school" has really encouraged her to take the initiative in packing her own bag, I of course help! She loves having her own little backpack for trips. ***The 2015 styles are a little more spacious and easier to handle than previous years. Mutsy Grow Up Booster-I had the Fisher-Price Spacesaver Seat, which I loved, but I was tired of having that eye sore in my home. It was also really annoying that the seat never pushed under the table. Thus, began the search for a comfortable booster seat that would fit under the table, would strap to the chair, and had a lap belt. That’s when I can across Mutsy Booster. It had all of the above, plus it looked good and matched my décor. There are a few different colors available. I’m sure you can find something that will coordinate well. The Honest Company Hand Sanitizer- Any hand sanitizer will do, but I have a fondness for spray sanitizer, mainly this one. It doesn’t dry out your hands. Ff your hands are already dry, you can use this without irritating your already dry skin. I like it for Kait because it doesn’t get everywhere and it’s gentle. You can also pick it up at Target and Buy Buy Baby. If there is a BBB near you, you can actually use either Buy Buy Baby or Bed Bath and Beyond coupons toward these purchases. The Honest Company Bubble Bath-These are seriously the bubbliest most long lasting bath bubbles ever and they smell so good. Burt’s Bees Bubbles are a very close second to Honest Company's. Both are gentle on the skin. Itzy Ritzy Snack Happens Bags- These are my “everything” bags. I do have dedicated snack bags and everyday use bags. I have used them to hold little first-aid kits, pacifiers, berries, crackers, you name it. They are extremely sturdy and washable. Trust me on this one, they are great! Oxo Sippy Cup Cleaning Tool Set and BottleBrush- Really any bottle brush, I just like the stand for this one. I will probably always own a bottle brush. There are quite a few cups I can’t get my hand into and this surely comes in handy. 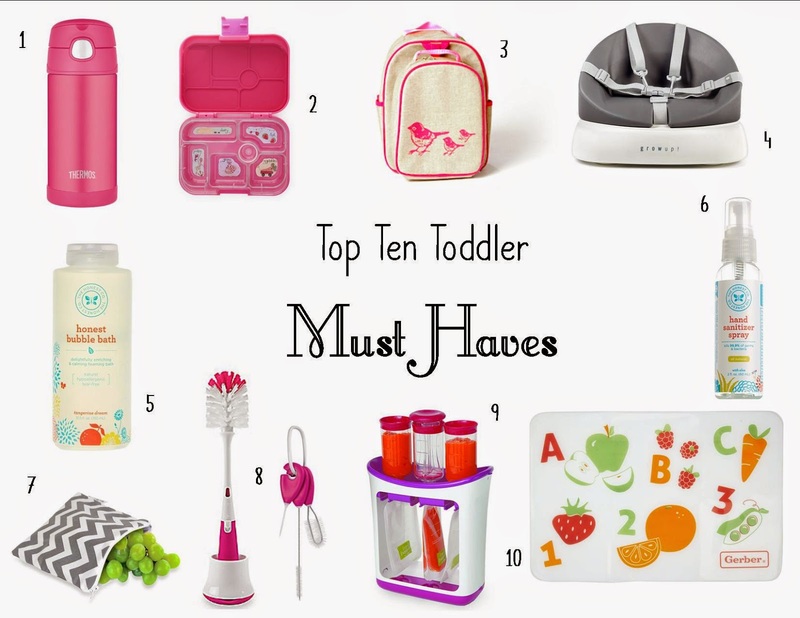 The tool kit is a must have in any kitchen whether you have a sippy cup or not. There is a pick that is great for getting things out of small holes or from under seals. The other two brushes in the set are for cleaning straws and other hard to get into places. Infantino Fresh Squeezed Station- I find that having this around makes it way more economical to have convenient and healthy snacks ready. I have packed yogurt, fruit purees, juices, and smoothies. I think I even put Jell-O in a pouch once! The caps are large and won't be a choking hazard for younger children. They are also clear and can be easily labeled. This little station makes filling the pouches virtually mess free and fast! The refill pouches come in a pack of 50 for about $12. Gerber Silicone Place Mat -I always have this in my purse; you never know when you might need it. What I like about this silicone place mat over others is that it has a small lip around the edge. It has saved us from a spill a time or two. The material sticks to the surface it is on so that it doesn’t slip around or move at all. I also have a spare to do arts and crafts on. I especially like that they don’t require a ton of storage space. The only down side is that the material attracts lint. I just carry it around in an Itzy Ritzy snack bag and voila, problem solved! Great review! Over the past two years I have fallen in love with this cup! The blue Thermos Mountaineer cup (see image) was purchased 2 years ago for our then – kindergartner and has now been used daily through two years of school. Although a little scratched on the outside, it still works perfectly.Read about the benefits of using a bottle cleaning brush.